During normal discharge the phone indicates the user that the battery will drain after some time. If not recharged, the SW detects that battery voltage is too low and shuts the phone off through a normal power down procedure. Anyway, if the SW fails to power down the phone, the CCONT resets and powers down the phone if the battery voltage drops below 2.8V. An external LDO Regulator exists for accessory power supply purposes. All ACI-accesso-ries require this power supply. Regulator input is connected to battery voltage VBAT and output is connected to Vout pin in the system connector. Regulator is controlled via UPP (On Off-function). Battery voltage (idle) Battery voltage maximum value is specified during charging is active Battery voltage (Call) Battery voltage maximum value is specified during charging is active (dead) mode means that the main battery is not present or its voltage is too low (below EM ASIC N2200 master reset threshold) and that the back-up battery voltage is too low. The main battery is not present or its voltage is too low but back-up battery voltage is adequate and the 32kHz oscillator is running (RTC is on). Note A new battery's full performance is achieved only after two or three complete charge and discharge cycles The battery can be charged and discharged hundreds of times but it will eventually wear out. When the operating time (talk-time and standby time) is noticeably shorter than normal, it is time to buy a new battery. 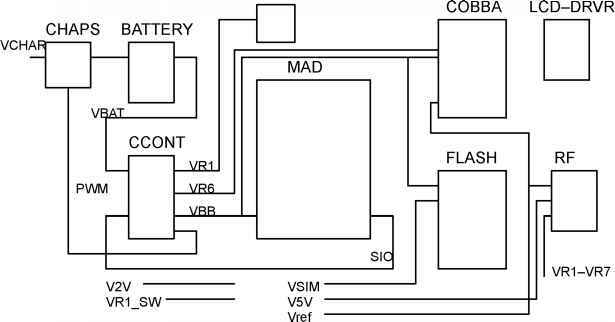 Battery voltage VBAT is connected to CCONT which regulates all the supply voltages VBB, VR1-VR7, V2V, VR1_SW, VSIM and V5V. VR7 is divided into VR7 and VR7_bias. VR7_bias is for RF, because PA is heating and this reduces the heat. CCONT enables automatically VR1, VBB, V2V_core, VR6 and Vref in power-up. 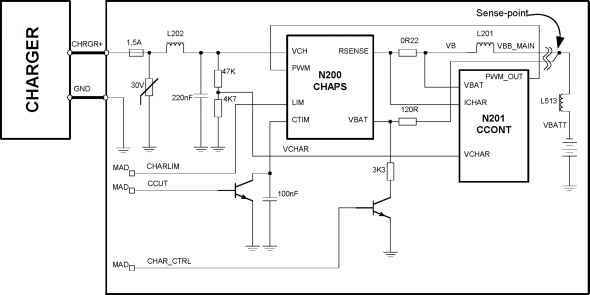 When battery voltage is under 3.0V, CHAPS controls independently the charging current to battery. The bending of the battery-spring should always be done, also with new batteries After changing the RTC-battery it is necessary to charge it. This can easily be done by assembling the BLB-2 battery to the phone for 10 to 15 minutes (It is not necessary to switch on the phone). After that, RTC-battery should be able to save the clocktime. The phone is powered by a 3-pole BL-6P 850 mAh battery. The three poles are named VBAT, BSI and GND where the BSI line is used to recognize the battery capacity. This is done by means of an internal battery pull down resistor. VBAT (Battery voltage) The BSI line is used to recognize the battery capacity by a battery internal pull down resistor. VBAT (Battery voltage) The BSI line is used to recognize the battery capacity by a battery internal pull down resistor. When the PWM output from N301 is active the feedback voltage is changed due to the presence of R308 and R309. When the PWM is active the charging switch regulator voltage is set to 10.5V maximum. This means that even if the voltage on the charger input exceeds 11.5V the battery voltage will not exceed 10.5 V. This protects N301 from over voltage even if the battery was to be detached while charging. V305 is a schottky diode that prevents the battery voltage from reverse bias V304 when the charger is not connected. The leakage current for V305 is increasing with increasing temperature and the leakage current is passed to ground via R308, V303 and R304. 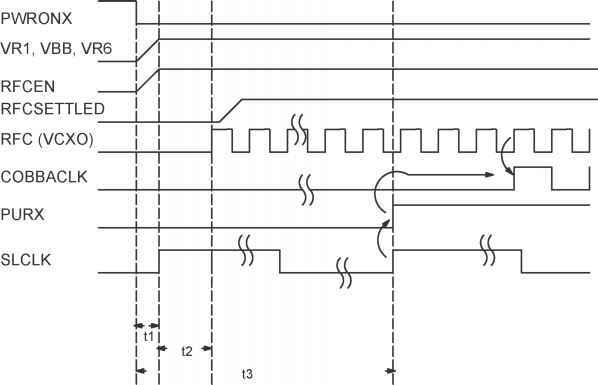 This arrangement prevents V304 from being reversed biased as the leakage current increases at high temperatures. Different battery types are identified by a pull-down resistor inside the battery pack. 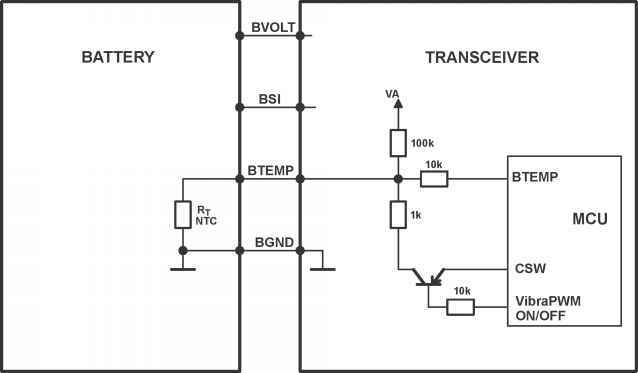 In the baseband area of the transceiver, the BSI line has a 150k pull-up to VBB. The MCU can identify the battery by reading the BSI line DC-voltage level with a CCONT (N201) A D-converter. 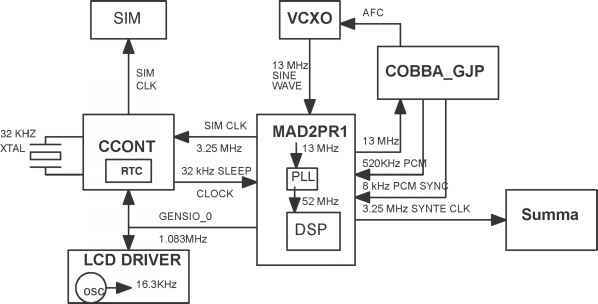 The device has two clock signals SYS_CLK (19.2MHz, 26.0MHz, or 38.4MHz supported) and SLEEP_CLK (32.768kHz). The SLEEP_CLK is supplied all the time the phone is switched on. To maximise the phone standby time, it is only necessary to provide a SYS_CLK signal when Bluetooth activity occurs, such as sending Bluetooth data to another device, or checking periodically if there are any other Bluetooth devices attempting to communicate with it. At other times when the Bluetooth device is in standby mode or the FM radio is switched on it is only necessary to provide a SLEEP_CLK signal. 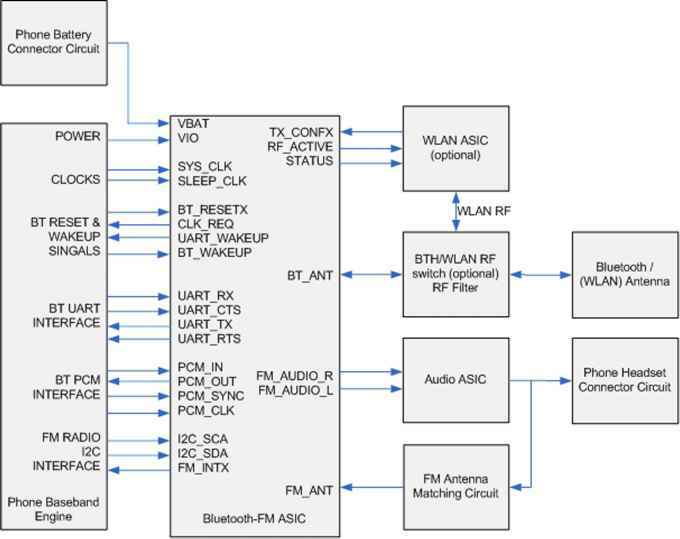 The Bluetooth-FM ASIC is powered directly from the phone battery voltage line (VBAT). An internal regulator is enabled when Bluetooth or FM radio is switched on. The battery temperature is measured during charging. The BTEMP pin to the battery is pulled up on baseband by a 47 kohm resistor to logic supply voltage, 3.2V. The voltage on the BTEMP pin is a function of the battery pack temperature. Auxiliary A D channel 3 is used for this purpose. Inside the battery pack there is a 47 kohm NTC resistor to ground. The A D converter value can be calculated from the following formula where RNTC is the value of the NTC resistor inside the battery pack. - HD947 uses a two cell semi fixed NiMH battery-pack only, giving 2.4V nominal supply voltage. Thus the usual NMP battery interface is modified. - The supply voltage inside the phone is delivered by a DC DC converter, which step up the battery voltage to 3.1 - 4.2 V supplying the regulators and PA's of the phone. Your device is powered by a rechargeable battery. The battery intended for use with this device is BL-5J. Nokia may make additional battery models available for this device. This device is intended for use when supplied with power from the following chargers AC-8, AC-5. The exact charger model number may vary depending on the type of plug. The plug variant is identified by one of the following E, EB, X, AR, U, A, C, or UB. 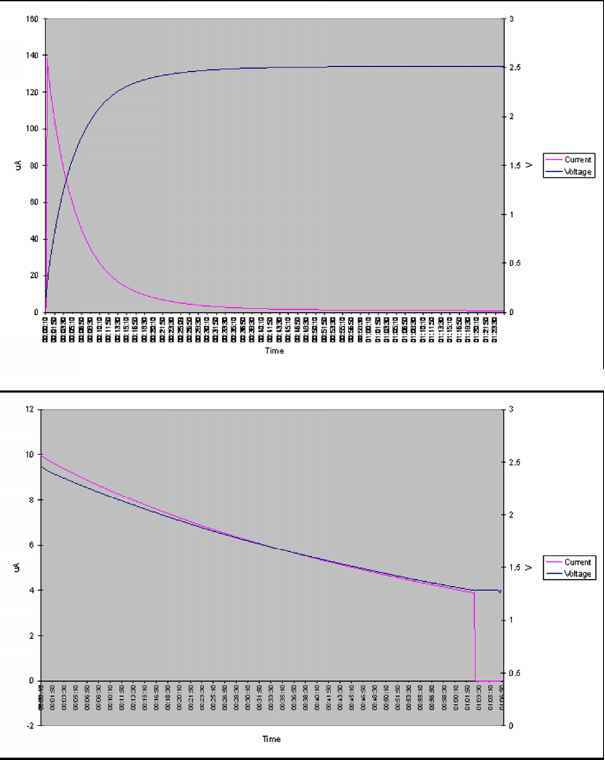 For saving battery capacity and because of insufficient linearity in digital mode, output power is decreased from level 2 to level 2.5, when battery voltage drops below 3.3V. (tbd.). The power reduction is done linearly as a function of battery voltage. Vcc 3.3V 3.1V -> PL2 PL2.5. Current through leds is controlled by transistor circuitry. External transistor driver circuitry is used as constant current source in order to prevent any change in battery voltage be seen as changing led brightness. Battery voltage is changing for example during charging depending on a charger, battery type and age. When the charger is connected, CCONT will switch on the CCONT digital voltage as soon as the battery voltage exceeds 3.0V. The reset for CCONT's digital parts is released when the operating voltage is stabilized (50 us from switching on the voltages). Operating voltage forVCXO is also switched on. The counter in CCONT digital section will keep MAD2WD1 in reset for 62 ms (PURX) to make sure that the clock provided by VCXO is stable. 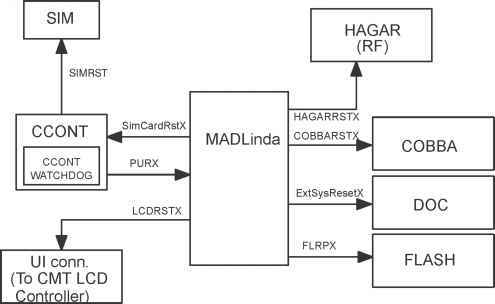 After this delay, MAD2WD1 reset is released, and VCXO -control (SLEEPX) is given to MAD. The next diagram explains the power on procedure with charger (the picture assumes empty battery, but the situation would be the same with full battery) 1 Battery voltage over 3.0 > Digital voltages to CCONT 2 CCONT digital reset released. VCXO turned on 3 62ms delay before PURX When the phone is powered up with an empty battery pack using the standard charger, the charger may not supply enough current for standard power-up procedure and the power-up is delayed. When the battery is placed in the phone the power key circuits are energized. When the power key is pressed, the system boots up (if an adequate battery voltage is present). (dead) mode means that the main battery is not present or its voltage is too low (below N2200 AVILMA master reset threshold) and that the back-up battery voltage is too low. The main battery is not present or its voltage is too low but back-up battery voltage is adequate and the 32 kHz oscillator is running (RTC is on). Intelligent battery packs have a possibility to power up the phone. When the battery gives a short (10ms) voltage pulse through the BTEMP pin, the CCONT wakes up and starts the power on procedure. When the charger is connected CCONT will switch on the CCONT digital voltage as soon as the battery voltage exceeds 3.0V. The reset for 1 Battery voltage over 3.0 > Digital voltages to CCONT (VBB) 2 CCONT digital reset released. VCXO turned on 3 62ms delay before PURX released 1 Battery voltage over 3.0 > Digital voltages to CCONT (VBB) 2 CCONT digital reset released. VCXO turned on 3 62ms delay before PURX released When the phone is powered up with an empty battery pack using the standard charger, the charger may not supply enough current for standard powerup procedure and the powerup must be delayed. During system start-up, in RESET state, the regulators are enabled, and each regulator charges the capacitor(s) at the output with the maximum current (short circuit current) it can deliver. This results in battery voltage dropping during the start-up. When a battery with voltage level just above the hardware cutoff limit is inserted, the system may not start due to excessive voltage dipping. Dropping below 2.8 V for longer than 5 us forces the system to PWR_OFF state. 1.1 The PSCC starts charging the battery with initial current. When the battery voltage reaches the switcher startup voltage level, the switcher will start up and supply the CCONT 1, which identifies the charger presence (vCHAr) In the end of the power up procedure initialized by adding the charger the phone goes to POWER ON ACTING DEAD state. In this state the only indication to the user are the battery charging alert and the scrolling battery mark in the display. In POWER ON ACTING DEAD state no actions against GSM network are done, the phone remains unknown to the network. This device is compliant with Bluetooth Specification 2.0 + EDR supporting the following profiles advanced audio distribution, basic imaging, device identification, dial-up networking, file transfer, generic access, generic audio video distribution, generic object exchange, hands-free, headset, object push, phone book access, serial port, and SIM access. To ensure interoperability between other devices supporting Bluetooth technology, use Nokia approved accessories for this model. Check with the manufacturers of other devices to determine their compatibility with this device. Features using Bluetooth technology increase the demand on battery power and reduce the battery life. Your device is powered by a rechargeable battery. The battery can be charged and discharged hundreds of times, but it will eventually wear out. When the talk and standby times are noticeably shorter than normal, replace the battery. Use only Nokia approved batteries, and recharge your battery only with Nokia approved chargers designated for this device. 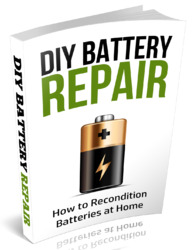 If a replacement battery is being used for the first time or if the battery has not been used for a prolonged period, it may be necessary to connect the charger, then disconnect and reconnect it to begin charging the battery. Your device is powered by a rechargeable battery. The battery intended for use with this device is BL-5CT. Nokia may make additional battery models available for this device. This device is intended for use when supplied with power from the following chargers AC-8 AC-15. The exact charger model number may vary depending on the type of plug. The plug variant is identified by one of the following E, EB, X, AR, U, A, C, K, or UB. The ignition sense feature prevents your car kit from draining the car battery by executing an auto power off in 20 seconds after the ignition key has been turned off. The blue wire of the power cable is used for the ignition sense feature. The use of ignition sense is recommended to prevent accidental draining of the car's battery. The wire is connected via a 1 A fuse to a 12 24 volt potential that is controlled by the ignition key. Do not connect it directly to the high voltage sections of the ignition circuit. When a charger is connected, the CHAPS is supplying a startup current minimum of 130mA to the phone. The startup current provides initial charging to a phone with an empty battery. Startup circuit charges the battery until the battery voltage level is reaches 3.0V (+ - 0.1V) and the CCONT releases the PURX reset signal and program execution starts. Charging mode is changed from startup charging to PWM charging that is controlled by the MCU software. If the battery voltage reaches 3.55V (3.75V maximum) before the program has taken control over the charging, the startup current is switched off. The startup current is switched on again when the battery voltage is sunken 100mV (nominal). The master reset threshold controls the internal reset of N2200 (N2300). If battery voltage is above VMSTR, N2300's charging control logic is alive. Also, RTC is active and supplied from the main battery. Above VMSTR, N2300 allows the system to be powered on although this may not succeed due to voltage drops during start up. SW can also consider battery voltage too low for operation and power down the system. The master reset threshold controls the internal reset of EM ASICs. If battery voltage is above VMSTR, N2300 charging control logic is alive. Also, RTC is active and supplied from the main battery. Above VMSTR, N2300 allows the system to be powered on although this may not succeed due to voltage drops during start up. SW can also consider battery voltage too low for operation and power down the system. NOTE Baseband doesn't wake up automatically when the battery voltage is connected. Power must be switched on by Parameters cannot be set accurate enough by design because of component tolerances. Due to use of 5 resistor values, the channels of the CCONT A D converters need to be aligned in the production phase. Within battery voltage tuning the MCU software reads the A D reading from CCONT at 4.1V and stores this reading to emulated EEPROM memory as a reference point. Another reference point is created by assuming that while the input voltage is zero, A D reading is also zero. Now the slope is known and A D readings can be calibrated. Calibration is included in VBATT A D reading task. There are three regulators in the RF unit. The 1st regulator is used for the synthesizers and the VCTCXO. The 2nd regulator is used for the receiver and the transmitter discrete circuits. The 3rd regulator is for the CRFRT, integrated RF circuit. The regulators regulate the battery voltage to the fixed 4.8 V level. The receiver, synthesizer and transmitter circuits can be switched ON and OFF separately. Switching sequence timing depends on the operation mode of the phone. The MCU and the CCONT circuits control charging together, detection being carried out by the CCONT and higher level intelligent control by the MCU. The MCU measures battery voltage by means of the COBBA via DSP. Charger voltage and the temperature and size of the battery are followed via the MCU internal ADC. INT1 signal is used for the auxiliary A D converter channels in RFI2. These A D channles are used for baseband battery voltage and system board temperature monitoring . Two channels are used for battery monitoring. The start of the A D conversion task is timed in such a way that auxiliary channel 0 results are measured during transmission when the PA is active and channel 7 is measuring when the PA is off. Supply battery voltage to the battery pin After receiving one of the above signals, the UEM counts a 20ms delay and then enters it's reset mode. The watchdog starts up, and if the battery voltage is greater than Vcoff+ a 200ms delay is started to allow references etc. to settle. After this delay elapses the VFLASH1 regulator is enabled. 500us later VR3, VANA, VIO and VCORE are enabled. Finally the PURX (Power Up Reset) line is held low for 20 ms. This reset, PURX, is fed to the baseband ASIC UPP, resets are generated for the MCU and The monitored battery functions are battery voltage (VBATADC), battery type (BSI) and battery temperature (BTEMP) indication. 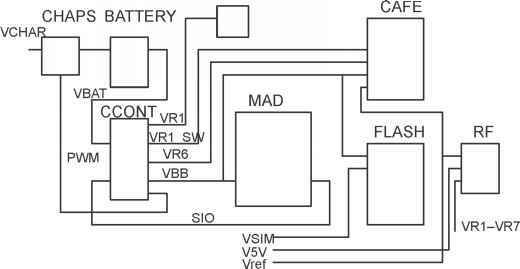 If the phone is off when the charger is connected, the phone is powered on but enters a state called Acting Dead, in this mode no RF parts are powered. To the user, the phone acts as if it was switched off. A battery charging alert is given and or a battery charging indication on the display is shown to acknowledge the user that the battery is being charged. The nominal battery voltage in NHX-7 is 3.6V. The actual battery voltage varies between 3.0 to 4.2V 5.3V depending on the used cell type (Li-Ion or NiMH) and whether the phone is connected to a charger (limit on 5.3V with NiMH battery in idle). Battery charging is controlled by a PWM signal from the MCU. The PWM duty cycle is determined by a charging software. The PWM signal is fed to the CHAPS charging switch and through the charging pins to an external charger. There can be two types of chargers connected to the phone. Battery 17 The CCONT comprises 6 individually controlled regulator outputs for RF-section and two outputs for the baseband. In addition, there is one +5V power supply output (V5V). The CCONT also comprises a SIM interface, which supports both 3V and 5V SIM-cards. 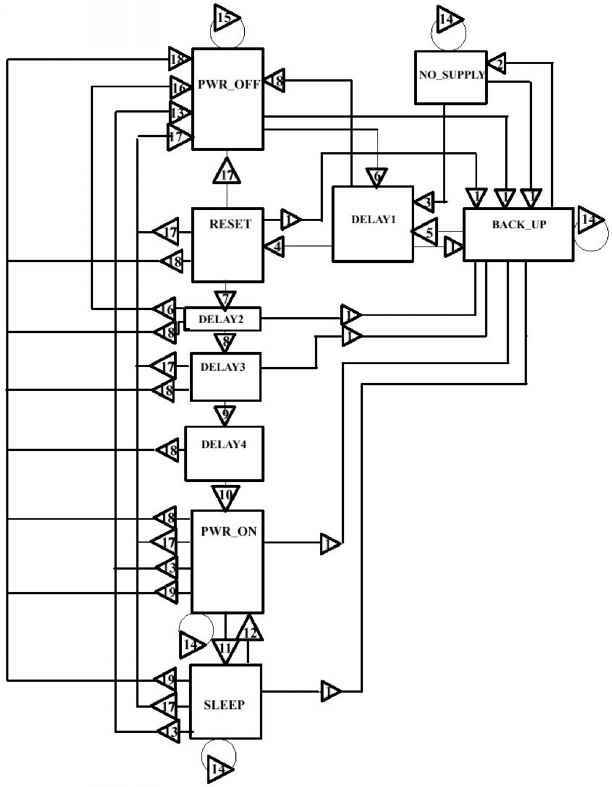 A real time clock function is integrated into the CCONT, which utilizes the same 32kHz clock supply as the sleep clock. The battery charging is controlled by a PWM-signal from the CCONT. Battery voltage Battery temperature indication Phone has a 100k (+-5 ) pullup resistor, Battery package has a NTC pulldown resistor. If the battery voltage reaches Vstart limit, before the SW has taken control over the charging, the startup current is switched off by the PSCC. When the charger has been recognized as valid, the SW tries to force the PSCC into fast charging, by pulling PSCC_PWM low, no matter how low the battery voltage is. 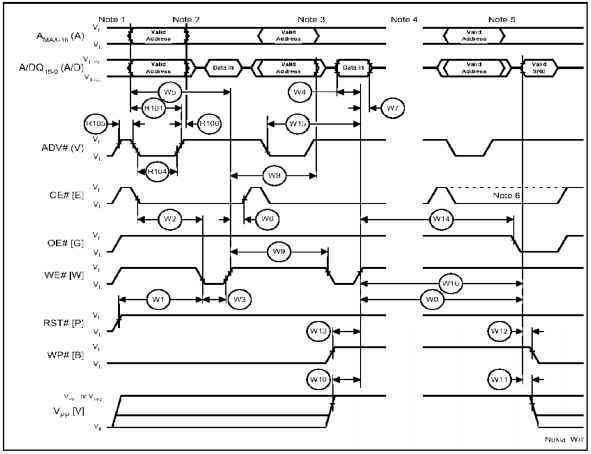 As soon as Vb reaches the threshold when the internal state of the PSCC is changed to PWM mode ( Vb> Vpwm) the PSCC responds to the PWM control and closes the internal power switch. In this state the charging current is determined by the actual charger. INT1 signal is used for the auxiliary A D converter channels in RFI2. These A D channles are used for baseband battery voltage monitoring. Two channels are used for battery monitoring. The start of the A D conversion task is timed in such a way that auxiliary channel 1 results are measured during transmission whne the Pa is active and channel 8 is measuring when the PA is off. After the PWR-key has been pushed, the CCONT gives PURX reset to the MAD and COBBA, and turns on the VR1, VBB and VR6 regulators (if battery voltage has exceeded 3.0 V). 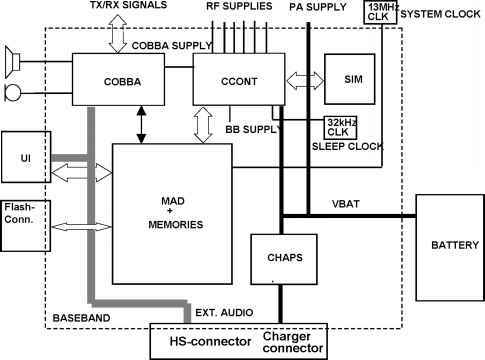 VR1 supplies the VCXO, VBB supplies the MAD and digital parts of the COBBA, and VR6 supplies analog Power off when battery voltage low During normal discharge the phone indicates the user that the battery will drain after some time. If not recharged, the SW detects that battery voltage is too low and shuts the phone off through a normal power down procedure. Anyway, if the SW fails to power down the phone, the CCONT resets and powers down the phone if the battery voltage drops below 2.8V. From hardware point of view the phone could otherwise continue functioning normally, but if the charger voltage is higher than the maximum allowed battery voltage, this can damage the RF parts. Therefore, output overvoltage protection is needed in case the battery is removed when a charger is connected, or if a charger is connected before the battery to the phone. With a charger connected, if VBAT exceeds preset limits in CHAPS, the switch turns OFF immediately (soft switching bypassed). There are two voltage limits, VLIM1 and VLIM2. VLIM input '0' selects VLIM1, VLIM input '1' selects VLIM2. The PHF-3 has external connections to car battery, ignition sense, car radio muting, external microphone and external speaker. The unit has a HF-connector that provides an interface to the phone via external antenna unit. The connection can be made directly or using the extension cable between PHF-3 and AAH-1D. There is also an internal speaker inside the handsfree unit. The PHF-3 is always connected to the car battery. To save the car battery, PHF-3 goes in to the sleep mode if the car is not running and or the phone is not connected. If the battery voltage is dropped below the operation limit, either by not charging it or by removing the battery. The power down is controlled by the MAD. When the power key has been pressed long enough or the battery voltage is dropped below the limit the MCU initiates a power down procedure and disconnects the SIM power. Then the MCU outputs a system reset signal and resets the DSP. If there is no charger connected the MCU writes a short delay to CCONT watchdog and resets itself. After the set delay the CCONT watchdog expires, which activates the PURX and all regulators are switched off and the phone is powered down by the CCONT. Within battery voltage VBATT tuning the MCU software reads the A D reading from CCONT at 3.6V and stores this reading to EEPROM memory as a reference point. Another reference point is created by assuming that when the input voltage is zero, A D reading is also zero. Now the slope is known and A D readings can be calibrated. Calibration is included in VBATT A D reading task. Battery charging voltage VCHAR and current ICHAR are calibrated using one test setting. Test jig in production line must have a connection to battery terminals. ICHAR is adjusted to 500mA and VCHAR to 8.4V with appropriate load connected to the battery terminals. Transceiver with BP-4L battery pack Transceiver with BP-4L battery pack Note A new battery's full performance is achieved only after two or three complete charge and discharge cycles The battery can be charged and discharged hundreds of times but it will eventually wear out. When the operating time (talk-time and standby time) is noticeably shorter than normal, it is time to buy a new battery. Use only batteries approved by the phone manufacturer and recharge the battery only with the chargers approved by the manufacturer. It should not be possible for charging current to flow from the backup battery into VOUT if VOUT happens to be lower than VBACK. Charging current will gradually diminish as the backup battery voltage reaches that of the regulation voltage. A vibra alerting device is used for giving silent signal to the user of an incoming call. The device is not placed in the phone but it will be added to a special battery pack. The vibra is controlled with a PWM signal by the MAD via the BTEMP battery terminal. 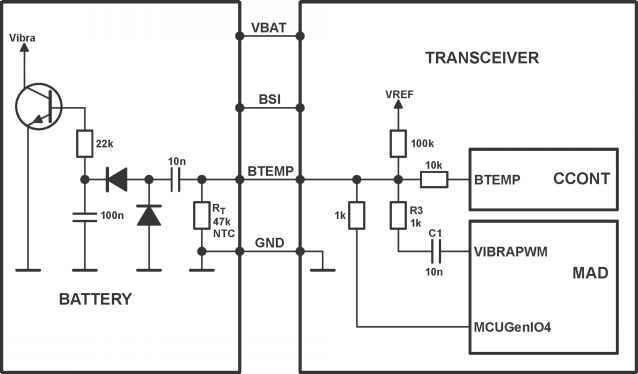 The regulator VRTC that supplies the real time clock is disabled in BACK_UP mode. Instead the unregulated backup battery voltage VBACK supplies the output of the VRTC. All other regulators are disabled and the phone has no functionality. Product NPL-2 uses the so called case-less Li Ion battery BL-4C. BL-4C battery capacity is 720mAh. This battery has a three-pin connector (BTEMP is not used). The battery does not support temperature measurement inside battery pack. In order to get temperature information of the battery, a NTC is mounted on the PWB within the BB area. Under normal conditions, the battery powers the baseband module. Individual regulators located within the UEM regulate the battery voltage VBAT. 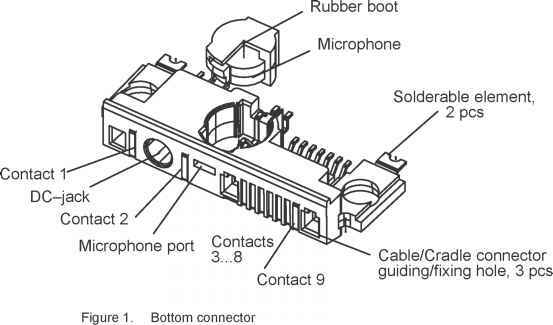 These regulators supply the different parts of the phone. 8 regulators are dedicated to the RF module of the phone, and 6 to the baseband module. The system boots up when power key is pressed (adequate battery voltage, VBAT, present). All the above are powered by the main battery voltage. Battery voltage is also used on the RF side for power amplifiers (GSM PA) and for RF ASIC Ahne. 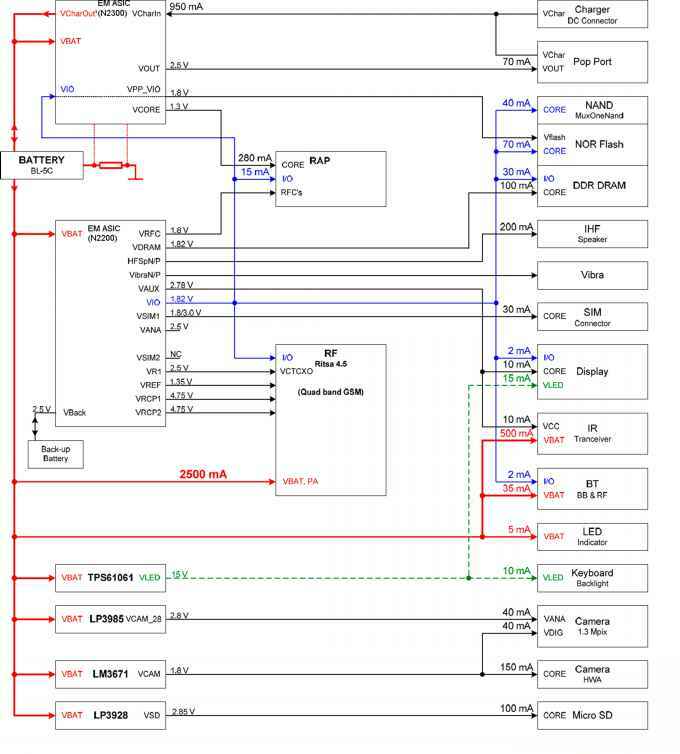 Because LED driver in EM ASIC (N2300) is not used, the external SMPS is used instead. External LED SMPS is still controlled by EM ASIC (N2300) and powered by battery voltage. The CCONT ASIC provides linear regulated power to most of the phone. It has a multiplexed A D converter for temperature sensor digitization, battery voltage, charger voltage, current consumption, and battery type detection. An external 32 kHz oscillator circuit is connected to CCONT, which is used for sleep clock generation. It also has a watchdog circuit used to power off the phone in the event that MCU receives an interrupt from power key depression, or an event has caused a process to over run and MCU does not service the register to prevent the watchdog timer from timing out. The idea is to connect these six LEDs parallel. LEDs are using current that is taken from battery voltage. The voltage is controlled by charge pump (NMP code 4341137) and the current by serial resistor. 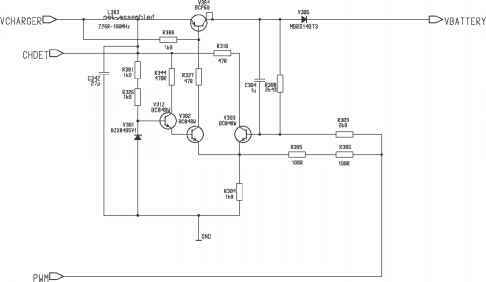 The idea of the charge pump is to keep the supply voltage of the LEDs constant although Vbat changes. Serial resistors limit the current that goes to LEDs. Current for one LED is 4mA. The circuit and LEDs consume 52mA current.